Qual Improv Health Care. 2018;24(2):2-14. Qual Improv Health Care. 2018;24(2):15-25. Chul-Gyu Kim, Ha-Min Yu, Hye-Won Kim, A-Yeon Nam, Hee-Sung Roh, et al. Qual Improv Health Care. 2018;24(2):26-40. Ja-Hae Chun, Hyun-Ah Kim, Mi-Jeong Kwak, Hyuo-Sun Kim, Sun-Kyung Park, et al. Qual Improv Health Care. 2018;24(2):41-61. Kyu-Tae Han, Eun-Cheol Park, Chung-Mo Nam, Tae-Hyun Kim, Myung-Il Hahm, et al. Qual Improv Health Care. 2018;24(2):62-75. 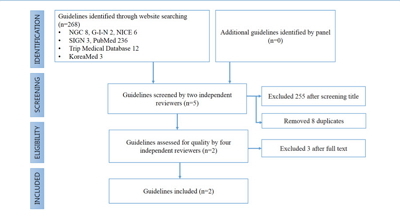 A Systematic Review and Meta-Analysis on the Effects of Urinary Tract Infections in the Water or Antiseptic for Periurethral Cleaning Before Urinary Catheterization Jin-Sook Kim, Mi-Jung Kim, Kuk-Hwa Kim, Da-Hae Lim Qual Improv Health Care. 2017;23(2):81-94. Impact of Healthcare Accreditation Using a Systematic Review: Balanced Score Card Perspective Il-Tae Park, Yoen-Yi Jung, Seong-Hi Park, Jeong-Hae Hwang, Seung-Han Suk Qual Improv Health Care. 2017;23(1):69-90. Impact of Healthcare Accreditation Using a Systematic Review: Balanced Score Card Perspective Il-Tae Park, Yoen-Yi Jung, Seong-Hi Park, Jeong-Hae Hwang, Seung-Han Suk Qual Improv Health Care. 2017;23(1):69-90. Prevention of Missing the Fee of Medical Supplies and Improvement Activity of Cost Cutting Hyun-ju Choi Qual Improv Health Care. 2015;21(1):52. Clinical Practice Guideline for Assessment and Prevention of Falls in Adult People Ja-Hae Chun, Hyun-Ah Kim, Mi-Jeong Kwak, Hyuo-Sun Kim, Sun-Kyung Park, Moon-Sook Kim, Ae-Lee Choi, Jee-In Hwang, Yoon-Sook Kim Qual Improv Health Care. 2018;24(2):41-61. 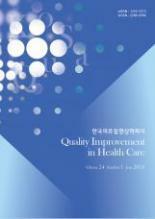 The Task and Role of the Quality Improvement Facilitator Moon-sook Kim, Hyun-ah Kim, Yoon-sook Kim Qual Improv Health Care. 2015;21(2):40. The Comparison of Appropriateness of Abdominal Computed Tomography (CT) and Abdominal Radiography Imaging Modality for Patients with Acute Nontraumatic Abdominal Pain Jung-Hup Song, Hun-Kyu Ryeom Qual Improv Health Care. 2018;24(2):15-25. Awareness and Correlation of Patient Safety Culture and Standard Precautions among Health Care Personnel Hye-kyung Kwon, Jae-sim Jeong, Bok-im Lee, Jang-han Kim Qual Improv Health Care. 2015;21(2):58. Copyright © Korean Society for Quality in Health Care. All rights reserved.